At my opening reception of the Bay Area Swiss Artists Show, I met Natalie Wagner, a Swiss dancer and choreographer, who is here in San Francisco for a six month residency. We decided to collaborate on a photoshoot and a few days ago we made it happen. Yes, I love the outdoor and landscape images, but I, although I don’t show them very often on this blog, enjoy taking images of people too. 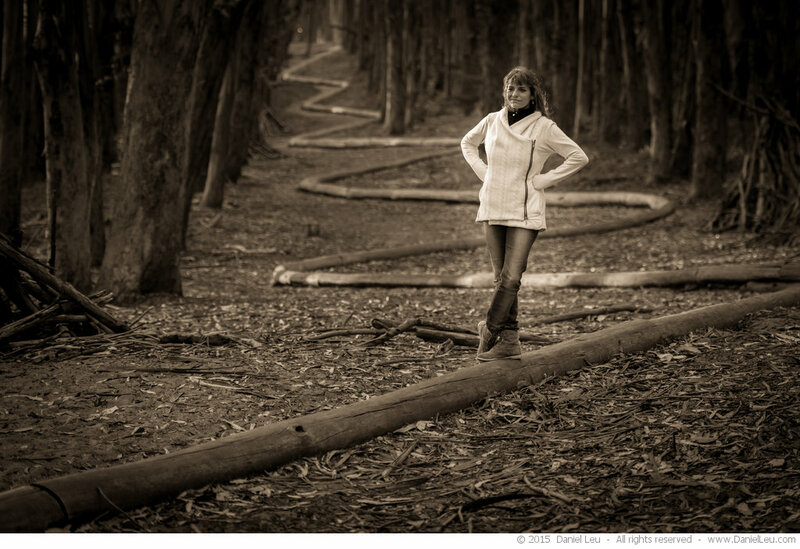 For this shoot we went to the Wood Line in San Francisco’s Presidio park. It is one of several outdoor art installations by British artist and environmentalist Andy Goldsworthy. 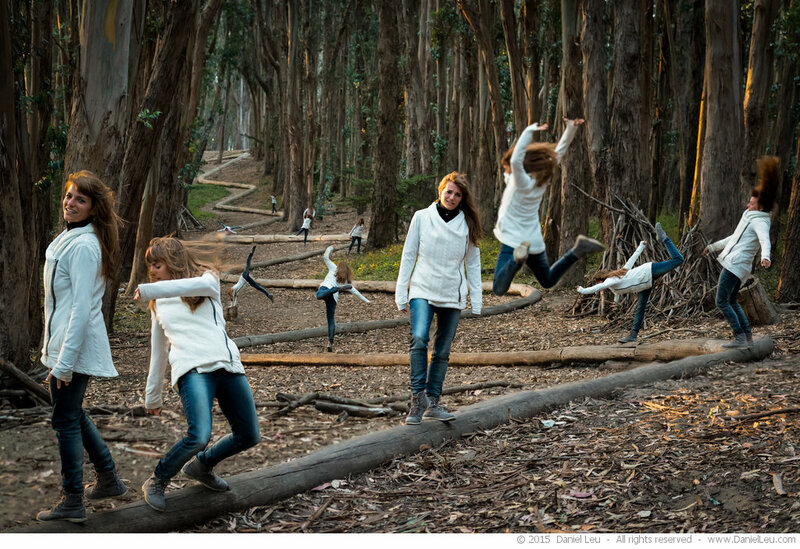 The idea behind this photoshoot was to create a composite where Natalie is shown in different places in throughout the image. It is like having several dancers on the Wood Line. The first sequence shows the entire Wood Line in the middle of a growth of Eucalyptus trees. Natalie was so energetic, I got images of her all over the place. Great! 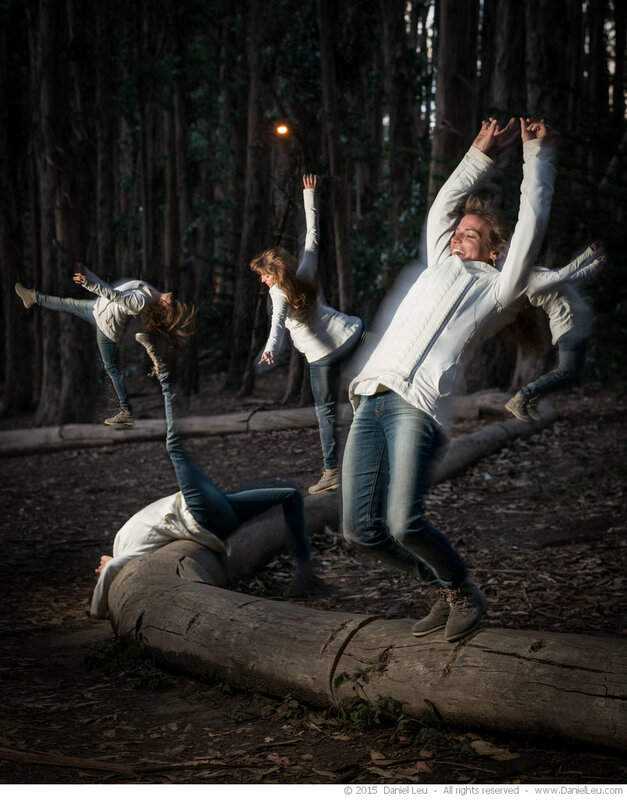 But afterwards, the challenge was creating a composite where the different captures didn’t or just barely overlapped. This was very challenging. Although fog was already getting into the bay and it was quite fresh, we were treated by some golden sunbeams during the first few minutes of the shoot. After this sequence I tried a tighter shot showing a smaller section of the Wood Line . Although I used a speedlight to freeze the motion, there was still enough ambient light to create ghosting and motion effects. I am very happy with the result. After these two composites, we had some more fun with Natalie dancing at the same location. This photoshoot with Natalie was a lot of fun. I am looking forward to the next one.